Sri Lanka is currently enjoying the perks of eco-tourism. With up to 500 vehicles entering national parks on a daily basis, our safari animals are under a great amount of pressure to simply be there. Despite the increased interest shown by tourists in going on safaris and the consequent boom in the related industries, little regard is given to the animals people are so eager to see. With the frequent killing of prominent tuskers, the cruel lynching of leopards, the illegal trapping and poaching of protected animals, and the tall mounds of plastic waste piling up in and around our parks in recent years, it is difficult to assure ourselves that sufficient importance is placed on sustaining one of the most lucrative tourist attractions of our nation: wildlife. If a hotel is expected to attract new visitors and make profit, the establishment must go to great lengths to ensure the proper maintenance of the premises and update its amenities. Additionally, it has to operate like ‘a well-oiled machine’, which not only implies that the machine should work but that it should be taken care of so that it will continue to work for years to come. For instance, the last of a noble line, the tuskers of Sri Lanka are on the verge of disappearance. Unlike in mainland India, only a small percentage of male elephants on the island carry tusks. It is estimated to be less than 200 animals. Out of these tuskers, very few grow to iconic status and bring awe and wonder to those who come across them. 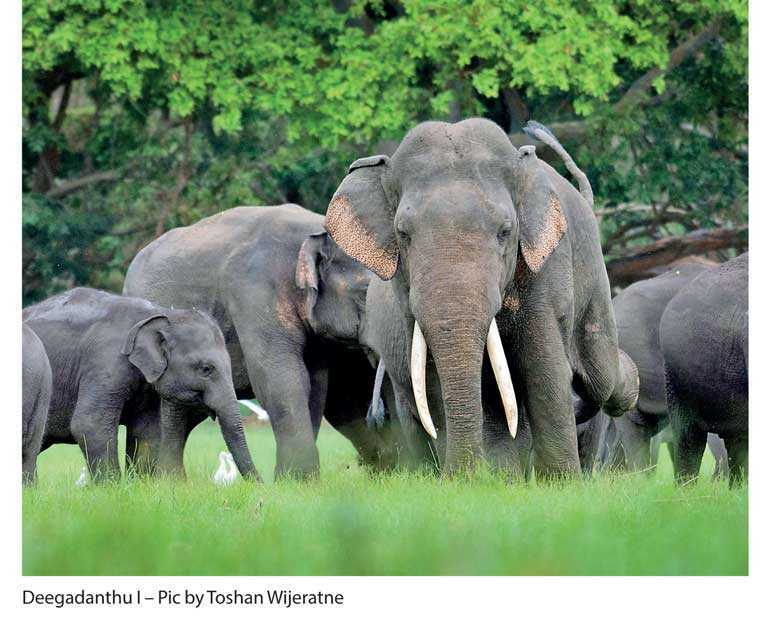 In the last decade, the island bade farewell to a number of iconic tuskers such as Wasantha from Wilpattu, the Crossed Tusker of Galgamuwa, and the majestic Parakrama from Siyambalangamuwa. At this rate, in the next decade or two, we will cease to have wild tuskers in our country. Deegadanthu I is one such iconic tusker. He is an impressive specimen who, in a few years, could match the size of Parakrama, and can be considered a national treasure. Right now, he is facing a life threatening situation. He was found with a gunshot wound in his leg in the beginning of June and needed to be treated with antibiotics. He was put on a course on 12 June. His predicament was published in the Daily Mirror on 13 June. Since then, sources claim he has not been treated in the last four weeks and is growing weaker every day with a swollen and infected leg. The challenge in treating him is the fact that he is located deep in the forests of the North Central province. Staff of the Department of Wildlife Conservation (DWC) venture into these forests regularly in search of this wounded giant and find him on most attempts, but when notifying the Department veterinarians to come immediately to treat him, do not get a favourable response. When they finally arrive, they fail to locate him. This unfortunate cycle has been repeating itself for the past few weeks, and as time passes, the tusker’s fate becomes direr. Sources claim that the tusker has resorted to eating the bark of trees and his physical condition is rapidly deteriorating. The result, if left untreated, would be a slow and painful death. The loss of one tusker may be insignificant to some, but this would be the loss of a national treasure and a living icon. Bulls of this calibre are not only important in maintaining strong genes in the elephant population of the island but go on to become substantial tourist attractions. Therefore, it is surprising that the fate of an animal of such prominence and value to the collective pride of our nation as well as its economy is treated with casual indifference. Unlike the oiling of a machine or the renovation of a hotel, bringing back our tuskers once they disappear from our island will not be an easy task. Replacing them with imported elephants from India will not rectify the irreparable damage we will have caused to our history and culture. Our majestic elephants make up a large part of the inheritance we owe to our future generations, not only because of their beauty but because they have been a part of our identity through the ages. Tuskers were once the pride of kings and kingdoms. Now, they make a larger contribution to our economy than some people are able to in a lifetime. Unfortunately, the Department of Wildlife Conservation’s veterinary team is having a difficult time locating the tusker who is moving about frequently despite his injury. Attempting to keep him in one place by erecting an electric fence had no success. Wildlife guides and the DWC’s efforts in locating him fall flat when the veterinarians fail to arrive on time. Perhaps they are ill-equipped, but hopefully not unconcerned. Their failure to respond to this need adequately, compounded by a lack of resources allocated to these officials, has left us with little choice but to face the great Deegadanthu’s potential untimely demise. And so, questions arise. What are we really doing to ensure the sustainability of a most lucrative industry? When is Sri Lanka going to allocate the necessary funds and expertise for the appropriate management of our wildlife? A renewable resource will only remain so if the conditions for renewal are favourable. Letting more vehicles into parks will not suffice if inside them, there is little to find.